This is my version of a traditional french fish soup that I learnt whilst working on cruise ships. 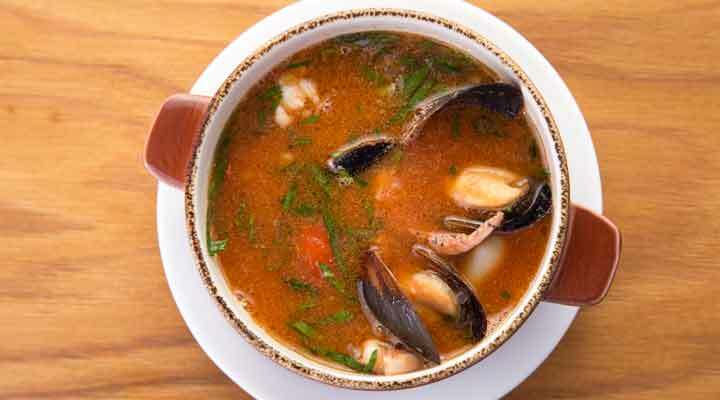 It can be used as a seafood chowder with a little trick, cream! First, prepare the broth, heat the oil in a large saucepan add the leeks, onions, garlic, fennel and cook for 2 minutes until soft. Add the tomatoes, herb stalks and fish bones. Flambé the mixture with Pernod and pour in the fish stock and saffron. Bring to the boil then simmer for 20-25 minutes. Meanwhile, in a large pot, place the potatoes and cover with water, saffron and salt. Bring to the boil and simmer for 15 minutes until slightly firm. Drain and cut each potato in half. Keep until required. Now, prepare the rouille sauce, see recipe below. Pass the fish broth through a large sieve, rubbing with the back of a ladle. Discard the bones and other debris. Pour the broth through a fine sieve twice, again rubbing with a ladle. Check seasoning. To finish the bouillabaisse, place the potatoes into a large saucepan then pour over the fish broth. Bring to the boil then over low heat, simmer for five minutes. Add the pieces of fish fillets and mussels and continue to simmer for another 5 - 8 minutes, add the prawns 2 - 3 minutes before serving or until the fish is just firm and the potatoes soft. Wash the potato, then place it in a saucepan and cover with cold water. Bring to a boil and simmer for about 30 minutes. In the meantime, Crush the saffron strands, and combine with 2 tbsp of boiling water in a small bowl to soak. Then peel and mash it to a smooth puree. Set aside to cool slightly. Put the potato and egg yolk into a bowl with garlic, saffron mixture and seasoning and combine well. Pour in the olive oil very slowly, beating steadily with a wooden spoon as if making mayonnaise, until you have a thick glossy sauce. Correct the seasoning. Pour the sauce into a bowl and refrigerate. This can be made a day before you need it, and it will hold up fairly well for 2-3 days covered in the fridge. This broth improves with flavour if left overnight, so prepare a day ahead and add the fish for poaching on the day it’s required. Serve some bread croutons to add some crunch and depth to the soup. Add 200ml of double cream to the final broth and the bouillabaisse will become a seafood chowder!